A beautiful doll’s house in sticker book form. Children will love adding stickers of furniture, pictures, toys, ornaments, clothes and more to the sumptuous Victorian interiors. 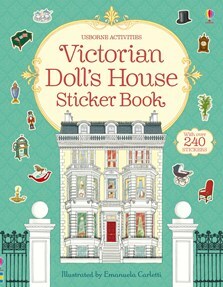 Includes over 240 stickers, allowing readers to arrange the house just as they want it. Rooms to decorate include the children’s bedroom, drawing room, pantry and garden and much more. With internet links to websites to find out more about how people lived in Victorian times. A delightful and informative book which any young girl will have hours of fun decorating, observing and enjoying.